August saw households pare back their borrowing and put a bit more money aside, accelerating a trend seen since the start of this year. 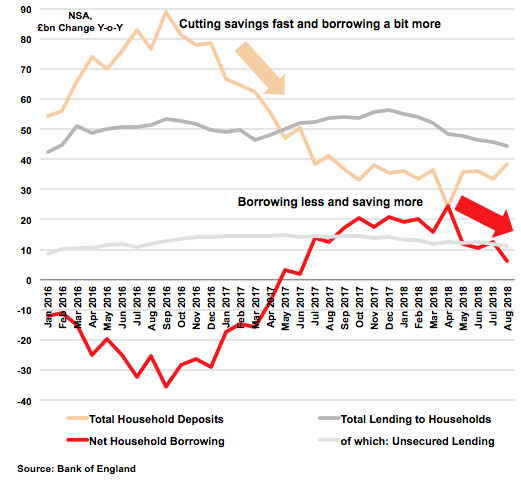 Late 2016's boom in net borrowing by households was due to a big fall in net income, which lagged significantly behind spending. To cover the gap, households ran down the amount saved each month drastically in order to maintain their expenditure. Now the reverse shift towards greater financial prudence by households appears to be driven by a mild recovery in net income growth, coupled with a waning appetite for borrowing that started a year ago. If August's retail sales (up 5.7% year-on-year, non-seasonally adjusted) are anything to go by, this does not mean UK consumers are holding back (outside of spending on the home, led by a cooling housing market), merely that their net income is rising faster and more closely in line with their expenditure plans. If Brexit 'jitters' are taking hold at all, they seem to be affecting borrowers the most.